The General Hospital Wub Tub: Vintage GH-O-Ween!! First off, I watched 30 min of yesterday's GH -- and LOVED Britt!! What fun. Talk about comic relief. She was just dropping bombs all over-- and Lulu with the Margaritas!! I loved it when she said "Kind of hard to picture her and Faison together!! You know Mary Pat's not long for this world..not with that hook coming at her. Carly's DNA is probs all over that lady! I can't believe I'm going to miss today but it's the end of the month, Halloweenie AND my kid is moving Thursday. It's apparently also time for my first stupid HEAD COLD for the season. Late in the game for me, but bad, bad timing!! OH!! "Dante" is back.... DZ tweeted this yesterday-- will he give Lulu the KISS OFF? Or is it going to be a good visit? Maybe they are filming Thanksgiving? VINTAGE HALLOWEEN PHOTOS...I think I share most of these every year but they are my favorites!! CLASSIC, Dr. O and Faison!! How young does Maruice look here!!?? Good ol Faith Roscoe, gone to soon. Have a spooky--I hope to get up a photo of Tillie later or maybe in the morning. My son moves tomorrow so I won't be on Thursday either. You'll have a place to comment though. Someone is going to have to tell me all the dirt!! It looks to me like the Teacher was the one who gave up her baby for Brad & Lucas and is grieving her loss. If Michael and her hook up at the group session they may find out what really happened to her baby.This would not turn out well for her if she finds out her baby died. This is just my theory but it could happen. Liked today's show. Looks like Ryan/Kevin is getting ready to lash out. Ava is becoming more and more unlikable. The kids were all so cute. Nice scene with Laura and Liz. Have to admit I fast forwarded Jason and Sam. I agree with you about sam and jason.they r too boring.snooze. I ff'd Jason and Sam too. Love seeing the kids in their costumes though. I'm wondering why no one has found Mary Pat yet. And I'm thinking maybe Ryan will kill Kiki as a gift to Ava. "OH!! "Dante" is back.... DZ tweeted this yesterday-- will he give Lulu the KISS OFF? Or is it going to be a good visit?" Hopefully it's the kiss off!!!!!!!!!!!!!! Griffin and Kiwi: When Matt Cohen snuck up on her, and he laughed, it felt like a real laugh. :) Like he couldn't stop himself from laughing. :) Cute. :) But uh it's not making me love them together. ICK! Ava and Kiwi: Oh Kiwi give me a freakin break!!! Kiwi: But I'm your daughter. Ava, Avery, and "Doc": Hehehe so cute Avery!!! :) They chose the quiet twin to use for this scene. Laura and "Doc": Looks like Laura is walking on egg shells with him! Hahahahaha! Jasam, Kid Cheeto and Jake: Jasam talking about the past. :) Hmmm no flashbacks? Awww! "Doc" and Felicia: Felicia!! "Doc" can't discriminate with anybody!!!! You know that!!! "Doc" wins the line of the day. "Doc": I think she should worry about my claws. Kiwi, Sasha, and Griffin: Oh yes Kiwi! Be delusional! Everything is going to work on wonderfully with your new sister. With her living with you, and Griffin showing up to see Sasha maybe half naked. Oh yes. Good times will be had by all! Maxie and Hiney: Happy birthday Maxie. How old are you? 30? :) Their scenes are not charming!!! No matter how pretty you dress it! Even with your Brady bunch love! And I love the Brady bunch!!! I want Lulu with Hiney!! For some reason I thought Maxie was a Christmas baby, oh well. "Doc" is becoming more angry, someone is bound to get a clue. 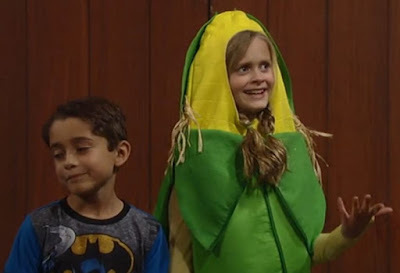 As for "corn" Joss, she was taller than Spencer then too.